DLNA is an industry standard for media (audio,video, photo) sharing within concept of a digital home and is supported by many hardware and software manufacturers. As of FW1.80, DLNA is supported by Playstation 3 entertainment system. 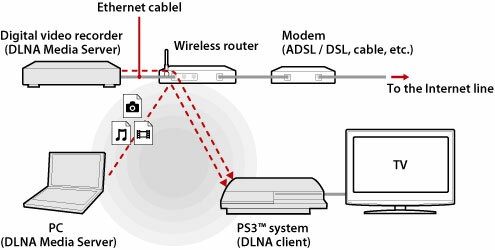 PS3 takes a role of DLNA Player, not DLNA server, so it can play a content of any DLNA server in you digital home, but can not stream the content to other players within DLNA protocols. A Windows PC can be set up as a DLNA Media Server by using Windows Media Player Media Sharing features. The following guide shows you how to set up Windows PC as a DLNA Media Server for PS3 video streaming. Have Windows Media Player 11 or later version installed on your PC. Now you have set up the Windows PC as a DLNA Media Server. Playing DLNA Media Server content on PS3 is easy. DLNA Media Servers on the same network are automatically detected by PS3 and icons for the detected servers are displayed under (Photo), (Music), and (Video) section. You just select your PC from the DLNA Media Server list under (Photo), (Music), or (Video), and select the file that you want to play. When you press PLAY, the Windows PC starts to stream media to PS3 and you can watch movies on HDTV that connected to your PS3. Windows Media Player can now be closed and your PS3 will continue to stream the media. But don't turn off your computer. Sounds good, right? It's not that perfect however, since you will be only play video files that are supported by PS3, and in some cases not even all of them. A solution here is transcoding. By transcoding videos to PS3 optimized streaming media formats like H.264 .mp4 videos you can have all your movie collections streamed to PS3 without a problem. 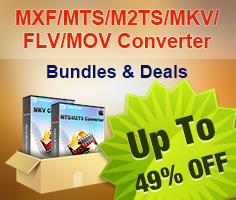 Pavtube PS3 Video Converter is recommended for video transcoding. The app is CUDA compliant and converts videos with fairly fast speed (Read how to convert MKV DTS video to PS3). Its developer Pavtube Studio also offers decent Blu-ray to PS3 Ripper app that can stream Blu-ray to PS3 with 5.1 audio and rip DVD to PS3 for playback.